Here’s another new painting headed for my upcoming “Flights of Fancy – Avian Art” exhibition to be held at The Gallery at WREN in Bethlehem, New Hampshire. This year is the 100th anniversary of the Audubon Society so I’m donating 10% of the sales from this show to the Audubon chapter in my area for the Pondicherry Wildlife Refuge, an important part of the bird migratory route. 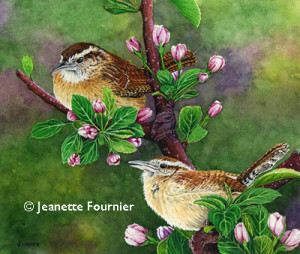 Given the name of the gallery, I just had to include a painting of some Wrens! I’ve titled this painting, “Spring Fling” and thought it would be a cheerful image to work on while we endure yet another snow storm until Spring arrives. This entry was posted in Exhibitions, Finished Art Work, Uncategorized and tagged art exhibit, bird art, carolina wren, Franconia Notch, NH Artist, songbirds, vermont artist, vermont watercolor society, watercolor art, white mountain artist, WREN gallery. Bookmark the permalink. Jeannette, how can we purchase the original of this work? Do we have to buy it from the Gallery, or can we buy it from you after the showing? You can purchase it either through the gallery prior to the opening of the show or directly with me after the show ends, provided it hasn’t sold before the show ends. If you are interested in purchasing it prior to the opening, that’s no problem, but the gallery will at least expect it to hang in the show for the opening night event and after that the artwork can be shipped to you or I can bring it to St. Albans sometime in June when I head over to the Bryan Gallery to deliver new work there. The price for this painting is $384.00 and the framed dimension is 16″ x 18″. Just let me know what you want to do and we’ll go from there!